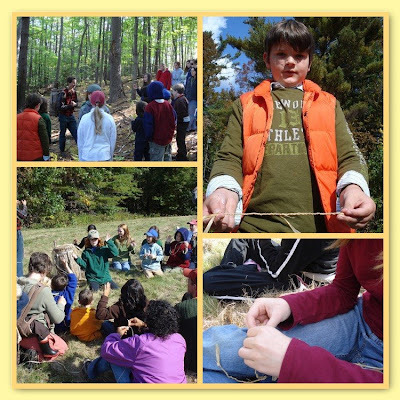 Yesterday we were given the gift of friends, a beautiful fall day and the chance to learn from two very inspiring teachers, Christopher and Ashirah Knapp of the Koviashuvik Local Living School (Temple, ME). Our friend Jean hosted a happy hoard of homeschoolers at her home and so we spent the day with the Knapps. In the calm manner that both the Knapps possess, they introduced themselves, talked about what they would teach us and who they learned from, stating that "it is always important to say who your teachers are". We viewed pictures of their handbuilt home in the Maine woods, their simple and sustainable life, and of how they use technology in a mindful way. Chris and Ashirah displayed many of the goods they have made and use on a daily basis. The 12" x 18" sheet of blueberry fruit leather was amazing, as were all the other beautiful goods like baskets, bowls and gloves. After getting acquainted we all went for a walk in the woods where we foraged for apples and gathered kindling for a fire planned for later. At the edge of the woods and field, Chris showed us how to identify and choose wintergreen leaves for tea. He said it was important to ask the plant if we could take some and to make sure we didn't pick from one area. After he said a quiet thank you to the wintergreen, we all collected leaves that would make our tea at the end of the day. As the field was being warmed by morning sunshine, we listened carefully to instructions Ashirah gave us on how to make string from bass wood shavings. 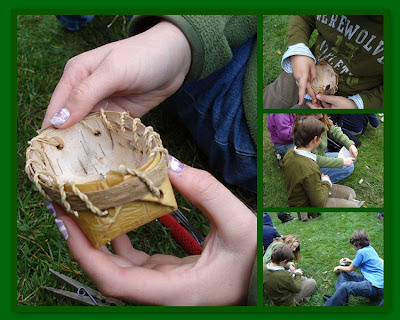 It took some of us longer than others (eh hem) to catch on to the "bite and twist" method, but most everyone successfully managed to make some amount of strong string that would be used later to make birch bark baskets. After making the string, Chris told us a story about how string was made into nets to catch salmon. He told the kids that as they walked back to the house they should be the net and be the salmon which turned into a fun game for the kids as they tried to catch one another with their "nets". With stomachs grumbling, we walked back to the house where we shared lunch and conversation. With lunch finished, Chris gathered us around the fire pit so he could demonstrate the use of the bow drill for making fire. 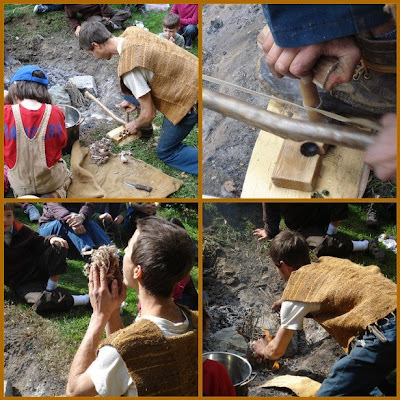 He shared a story about how the spark of fire was in all wood as he prepared the tinder and drill. We all watched, fascinated by how quickly a fire was started. He then added the collected wintergreen to pot of water and set this on the fire to boil for our tea. We were now ready to learn about making birch baskets. Next we gathered around Ashirah while she handed out practice paper and then birch bark for our baskets. We all fiddled a bit with the bark to miter the ends correctly but once we did, we were able to add the bark strips and then secure all of it with our string. With a bit of hand sewing we had mini-baskets. We closed the day by once again gathering around the fire and having tea in mugs we brought from home. The wintergreen made a clear, aromatic tea that had a quite sweet and surprising aftertaste. It was a good ending to the day, this sharing of tea around the fire. I think that all the parents were impressed with amount of care and preparation the Knapps took to share their knowledge with us. The Knapps have a unique talent for fostering a deep sense of well-being, respect, and gratitude for the gifts around us. The kids and I went home feeling both empowered and enriched by simple gifts--friendship, sunshine, meaningful work and shared ideals. What a fantastic day! I sure wish we could experience a day like that. The Knapps sound like such lovely people and have a great life. I recognized a little Native American beliefs in thanking the wintergreen plant. I would love to have tasted wintergreen tea! 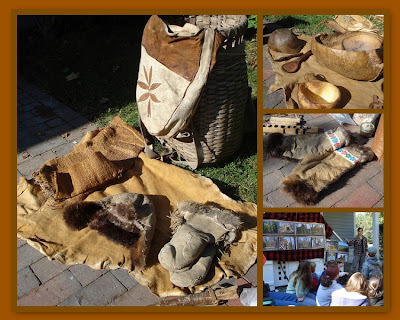 Anet, definitely lots of Native American practices embraced by the Knapps. (We hold similar beliefs and practices by thanking or asking Gaia for her gifts.) I thought of you often, in fact, thinking you and Noah would have fit in perfectly. very cool. we met Christopher Knapp at Common Ground and had a lengthy conversation with him. Would love to spend a similar day with my children sometime. I'm an afternoon tea devotee, as long as there's hot tea involved I'm happy! Hey Renee--where are you located again? Are you on Learning All The Time? We were at the fair and also saw Chris's demo on acorn flour. He has such great energy. Hot tea, yes, we go through lots here.